In one of the best El Clásicos I have seen, Messi showed ample determination and grit to give Barcelona the win. The game started out expeditiously, with both teams playing for the win. It was Real Madrid that committed most of the fouls in the first half. While Barcelona did what Barcelona normally do, displaying some glittering plays. I must admit, as a Barca fan I was a bit uneasy when I saw Gareth Bale on the Real Madrid’s starting 11. He missed the last two games for Madrid due to an injury, and I thought he would also be out of this match as well. We all know Ronaldo as Madrid’s main danger man, but Bale’s pace and abilities made him even more of a threat to us. To add to my concerns, we were missing our virtuoso on the ball, Neymar Jr. He was suspended for the El Clásico due to his antics in Brace’s match against Malaga. I hope Ramos will be extended the same courtesy the befell Neymar as he displayed the same behavior after being sent off in the 77th minute. Rafinha is normally Luis Enrique’s first choice replacement for MSN, but he is also unavailable due to injuries. Paco Alcácer was the man to replace Neymar Jr on the left wing, for what had to be the biggest match in his La Liga career. His performances in the last few matches he displayed, indicated that he was ready for such a momentous occasion. For the time being I am withholding judgement on him, as he is still relatively new to Barcelona’s style of play. But as a Barca fan, I demand ruthless possession and consistent wins. And this would require him to adjust immediately and produce wizardry performances fans are accustomed to. In the end, one man, or should I say alien, demolished Madrid’s defenses to push the scores in our favor. It was our savior King Leo Messi. After each goal the expression that was displayed on the Madrid’s players face said it all. It was as if they all agreed silently we were hoping we could stop him, but then again how could we. Rakitić passed to Messi in the box and he bamboozled Madrid’s defenses to equalize in the 33rd minute. I thought the substitution of Gareth for Asensio would make Madrid a more weakened opponent. But the young Spaniard brought on the field with him neoteric and vibrant energy. They were beginning to resemble yester year’s Galacticos: direct and relentless. It was the great Ivan that scored to put us in the lead again in the 73rd minute. It was a stunning strike that left the Santiago Bernabéu petrified. Paco was a bit out position at key moments in the game for me. He also had a clear chance but was unable to finish. I still think he requires time before he can be properly criticized, but I personally do not see him in the long term with us as if he was brought in as a last resort. Things seems a bit gloomy towards the end of the match for Barcelona. Madrid had a nice momentum going after their equalizer from James Rodríguez in the 85th minute, but what do you do when you need a goal for Barca? All Barcelona fans know the answer to that question. Give the ball to Messi, and that’s what Jordi Alba did. To be honest, I believe Messi looked a bit out of it in the final minutes. But he did what only Messi can do, the ability to change a game in a mere second. The Argentine somehow managed to find a bit of space and deliver a suburb finesse shot to beat the Costa Rican Navas. His strike was hotter than a beef patty fresh out the oven. Messi’s removal of his jersey should not have been sanctioned a yellow card. In fact, in my opinion FIFA officials should review that yellow card he received and discipline the ref issuing it in the first place. It was a statement the king had to make. Reminding the Madridistas who is the best in the world, and maybe of all time. Credit to the goalkeepers, they had a splendid game. I will no doubt remember this edition of El Clásico for years to come. 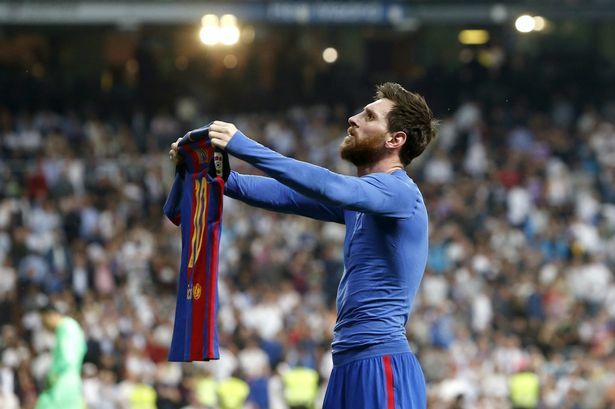 The game Messi gave and all the blood, sweat and determination to deliver the Barcelona fans a famous win over Real Madrid.